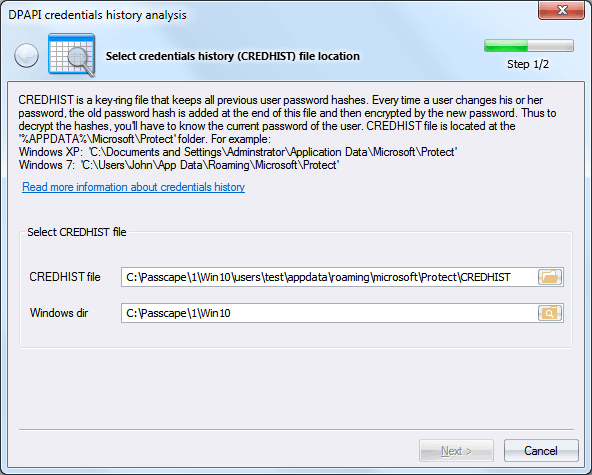 CREDHIST is a password history file, made out as a chain, where each link represents the user's older password hashes. Each time user changes the password, the old password hash is appended to the file and encrypted with a new password. Therefore, to decrypt all the hashes in a chain, you must know the user's current password. 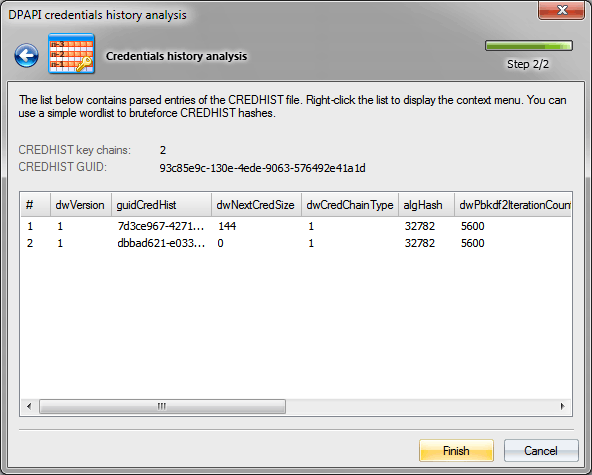 Along with hashes, the chains store other service data, which is also analyzed by this utility. On the screenshot, you can see that the CREDHIST identifier is 93c85e9c-130e-4ede-9063-576492e41a1d. This is the identifier (GUID) all user's Master Keys in the context of the data owner are attached to. The number of links in the hash chain is 2. The list below contains all attributes and their values for each link of our CREDHIST. To guess the original CREDHIST password, right-click on the attributes and then select 'Use a dictionary to validate password...' on the context menu that appears. You can validate password for both currently selected and all the records. The validation time increases proportionally to the number of the records (i.e. links). See the original CREDHIST password search speed comparative table. The speed is measured for a single-core of CPU Intel Q8400 2.66GHz for default OS configurations (for example, in Windows 7 the number of iterations in PBKDF2 may differ).